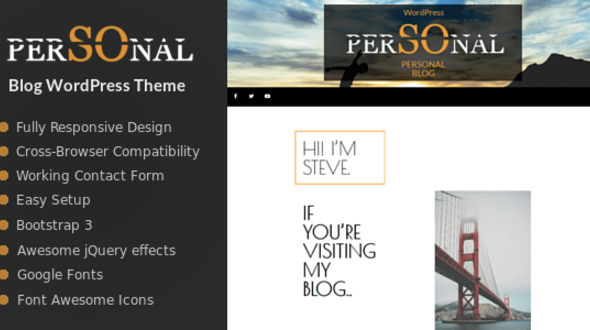 Personal – Blog WordPress Theme. Nice solution for any blog, businesses, eCommerce or portfolio websites. One of the best WordPress blogs themes. Personal includes awesome Home Page, which can be easy manage from admin area, 3 Layouts of Blog (with left and right sidebar, layout without sidebar) and 3 Gallery Layouts. Woocommerce WordPress theme has bbPress (forum software), BuddyPress (modern, robust, and sophisticated social network software), 6 Layouts for your Shop, Bootstrap pages, About Us page and FAQ page. You, can start building your website with our free blog WordPress theme – starter theme or with WordPress Quickstart of Personal, which include WordPress (the latest stable version) + Theme + Widgets + Images + demo content included. WordPress Quickstart from OrdaSoft allows you to install WordPress with demo data in few click and get website like on demo.